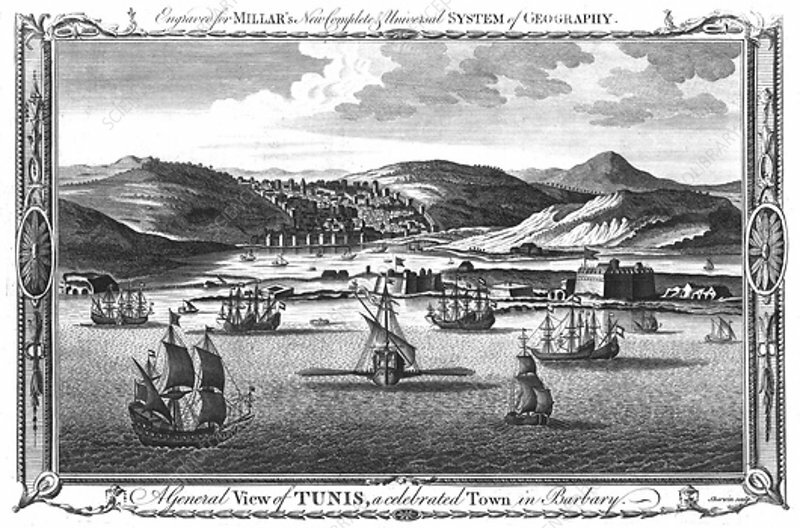 A General View of Tunis, a celebrated Town in Barbary. ', 1782. Sailing ships in the Mediterranean port of Tunis in Tunisia, North Africa. The term Barbary Coast (or Berbery or Berber Coast), derived from the Berber people, was used by Europeans from the 16th until the early 19th century to refer to Berber coastal regions of North Africa - the modern nations of Morocco, Algeria, Tunisia, and Libya. From Millar's New Complete Universal System of Geography. Published 1782.